Shifting Relations Between Pakistan and the U.S. Since 9/11, the United States has touted Pakistan as a “key ally” in the fight against terrorism, even though we’ve long suspected that some elements of the Pakistani government are working with the terrorist groups they claim to be fighting. The relationship became even more strained after the United States discovered that Osama bin Laden was hiding in a town populated by Pakistan’s military elite, not far from the nation’s top military academy. Where do we stand with Pakistan right now? The location of bin Laden’s hideout has raised questions about whether the government knew of his whereabouts, though officials have denied for years that bin Laden was in Pakistan. (For more on this, see our bin Laden reading guide.) Still, the United States has been trying to smooth out things with Pakistan since the raid. 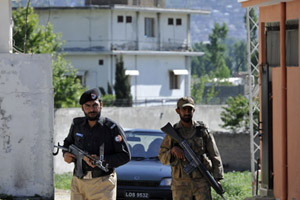 Pakistani officials have criticized the raid as a violation of the country’s sovereignty, and the military said it would rethink cooperating with the United States if there are any more unilateral attacks. The Pentagon announced Wednesday that it is complying with Pakistani officials’ request to scale back the U.S. military presence there. “Specifically, the United States is looking for Pakistan to demonstrate a willingness to go after senior al Qaeda targets, take action against factories producing improvised explosive devices for use against U.S. troops in Afghanistan, and support Taliban reconciliation,” CNN reported. Secretary of State Hillary Clinton paid a surprise visit to Islamabad Friday morning to work out the details of the U.S.’s relationship with Pakistan after bin Laden’s death. She said that the United States is expecting Pakistan to take “decisive steps” in its fight against terrorism over the coming days. Her visit comes after Pakistan agreed to let the CIA send a forensics team to examine the bin Laden compound more closely. What’s the situation with U.S. aid to Pakistan today? The United States has provided $20.7 billion in aid to Pakistan since 2002, $14.2 billion of which has gone to Pakistan’s intelligence service for its fight against terrorism. Military experts say Pakistan is vital because most supplies to U.S. forces in Afghanistan mustpass through Pakistan by truck. According to Wright, a major concern about cutting aid to Pakistan is that Pakistan may respond by barring U.S. drones from its airspace. Though civilian and military leadership have publicly condemned drone strikes, Pakistan’s English-language paper Dawn learned through WikiLeaks last week that Pakistan’s military has been requesting U.S. drone backup for its counterterrorism operations for years. Debates about cutting U.S. aid to Pakistan are ongoing. U.S. Secretary of Defense Robert Gates recently voiced his support for continuing military aid. While Pakistani security forces have long been suspected of working with terrorists groups like Lashkar-i-Taiba even after they were banned in 2001, specifics about the extent of the government’s present involvement haven’t been nailed down. In many cases, it’s unclear whether isolated officers of the ISI are working with terrorists, or whether the support is more widespread in the security forces. The fact that U.S. officials lumped the ISI together with terror groups in the leaked Guantanamo files suggests the United States believes it’s the latter. One of the big unanswered questions is the extent of the ISI’s involvement in the plot behind the Mumbai terror attacks. Some answers may emerge in the following weeks as Tahawwur Rana, one of the alleged plotters in the Mumbai attacks, stands trial in Chicago. The U.S. Justice Department has accused five men of helping to plan the 2008 attacks in Mumbai, India, which killed 166 people. Among the dead were six Americans, including a Brooklyn rabbi and his pregnant wife. Tahawwur Rana is being tried in federal court in Chicago for helping David Coleman Headley, who has confessed to scouting locations for the attacks. The United States has also indicted an alleged ISI officer in the case. That officer, known as Major Iqbal, is among the suspects who are still at large. The star witness in Rana’s trial is Headley, who has confessed not only to working for the terrorist group Lashkar-i-Taiba but also for the ISI. So far, Headley claims that ISI officers recruited him as an intelligence operative for the Mumbai attacks and that Major Iqbal funded and directed his reconnaissance and played a key role in the plot.